A student accused of being part of an international drugs trafficking operation sending £15 million worth of cannabis to Northern Ireland is to be released from custody, a High Court judge ruled on Thursday. Yahan Wang was granted bail after her parents travelled from China to live with her at an address in south Belfast. They are to put up a £20,000 cash surety as part of a series of strict conditions. Mr Justice Treacy said it was an exceptional case where he had been influenced by her potentially bright academic future. The 24-year-old Chinese national allegedly played a leading role in a gang suspected of dispatching packages to rented properties across Northern Ireland. The operation is connected to a major growing factory uncovered in Italy, according to the prosecution. Wang is charged with two counts of importing herbal cannabis, conspiracy to supply, and possessing the Class B drug with intent to supply between January and March 2015. She faces further counts of transferring, converting and possessing criminal property, namely cash. PSNI officers working with the National Crime Agency and Italian Carabinieri were said to have carried out searches at 18 properties in Northern Ireland this year. 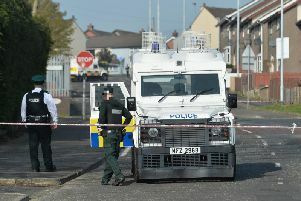 Addresses in Belfast, Greenisland, Bangor, Newtownards and Ballywalter are all under investigation. A prosecution lawyer previously told the court a “huge” amount of material has been recovered, including multiple packages sent from Italy. Wang allegedly accompanied two Chinese men who viewed some of the rental properties. During her bail application it was claimed that more than £15m worth of cannabis has been sent to Northern Ireland in a period stretching back more than a year. Prosecutors had opposed the accused’s bid to be release, claiming she may abscond. At a previous hearing the judge was told detectives believe that, together with her boyfriend, she is “at the top of the food chain”. It was also stressed that the investigation is still in its early stages. International letters of request are being prepared as the PSNI and Italian police seek to exchange any relevant information. In a further development, the court was told that voice identification is to be carried out as part of the investigation. Defence counsel claimed Wang came to Northern Ireland to help her partner rent properties for a restaurant business venture. She claimed £60,000 discovered the accused’s bank account came from her partner to help with her lifestyle. Wang was said to have been unaware the money may have been the proceeds of any criminal activity. Wang, with an address at Southside Central Walk in Birmingham, is said to be close to completing her degree in media studies. Although she is currently suspended from her university studies in Coventry, defence barrister Kelly Doherty stressed she hopes to continue on to a Masters course. The accused’s mother and businessman father were both in court for today’s hearing. Granting bail, Mr Justice Treacy described Wang’s ongoing academic studies as “compelling reasons” for why she will not try to flee. He stressed, however, that she will not be released until the £20,000 surety is lodged. Wang must then live with her parents at a flat in Fitzroy Avenue, report to police daily, and have no contact with her co-accused.